Icardi's contract expires in 2021, and his agent-wife Wanda Nara has been particularly outspoken over the past month in defense of her husband. 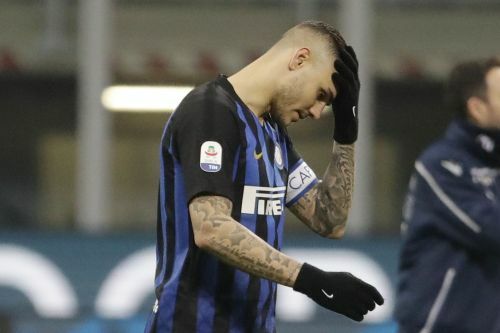 On Wednesday, amid a seven-match goal drought for Argentina forward, Inter announced that it was stripping the captain's armband from Icardi and giving it to goalkeeper Samir Handanovic. "It was a difficult and painful decision, we all know his worth," Inter coach Luciano Spalletti said. "We made it together with all of the components of the club and it was done exclusively for the good of Inter and of the team. There are some things concerning the player that had to be worked out. "He was disappointed, he was upset. It was difficult to tell him ... These things embarrass the team, of which he was captain, and the club." Icardi reacted to the decision by telling the club he could not play at Rapid Vienna in the Europa League on Thursday. He did not travel to Austria with the rest of the squad. Instead, Icardi was at the club's training ground in Appiano Gentile, just outside Milan, on Thursday along with other non-traveling players. "Mauro was included for the trip to Vienna but didn't want to be here. After lunch he told us that he didn't feel up to coming here with us," Spalletti said. "Obviously we're upset but there are things around that are disturbing him and the team. Now we have to just think about the match." Icardi also posted a picture on social media of him receiving treatment on his right knee, perhaps hoping to explain to Inter fans why he wasn't going to Austria. Inter's next match is on Sunday against Sampdoria. Although Icardi has scored loads of goals — he has 122 in 210 matches for Inter and is the ninth highest scorer in the club's history — he has also courted controversy. In 2016, Inter's hard-core "ultra" fans demanded he be stripped of the captaincy after he offended them in his autobiography. Icardi was fined by Inter and made to remove the incendiary comments from the book. His personal life has also been ridiculed by some. Nara is the ex-wife of former Sampdoria teammate Maxi Lopez. But Icardi has managed to win back the fans in the past, partly by being the youngest player to reach the 100-goal mark in Serie A. Lately, though, the goals have dried up. Icardi had been again chasing the top-scorer award — a prize he won last season and in 2015 — with nine league goals this season. He also scored four times in six Champions League matches. But he has not scored in Serie A since Dec. 15 — a run of seven matches and his longest goal drought at the club. Icardi's struggles in front of net have coincided with Inter's poor run of results. The team beat Parma 1-0 on Saturday to end a four-match winless streak in all competitions. The man who scored that lone against Parma — Lautaro Martinez, another Argentine — followed that up by scoring against Rapid Vienna as well in another 1-0 win, making sure Icardi's absence wasn't felt. "We'll have a striker who's equally as strong, even if he has played less than Mauro," Spalletti said. "Lautaro showed us at Parma that he didn't receive his nickname of El Toro (The Bull) by chance."